Washington, illuminated by the light falling into the room, stands in uniform before the president of the Continental Congress, Thomas Mifflin, and the delegates, among whom is Thomas Jefferson. Behind Washington are his aides-de-camp, Col. Benjamin Walker and Col. David Humphreys, and spectators. 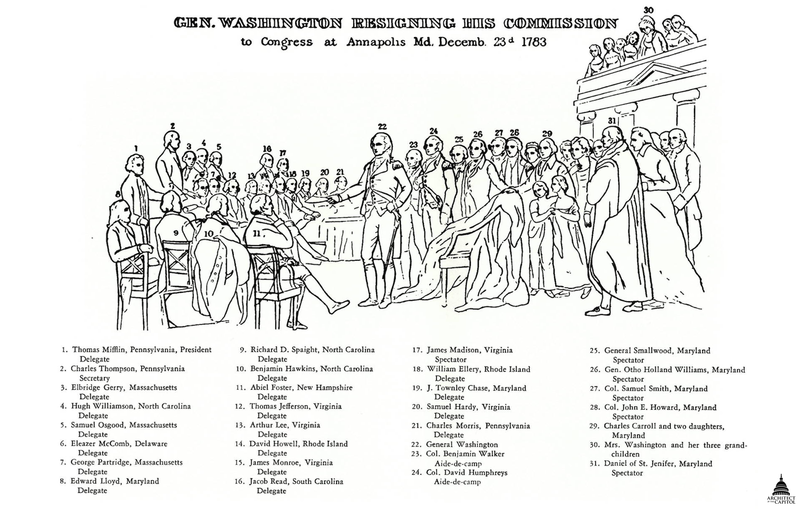 The delegates and spectators direct their attention to Washington as he extends his right hand to return his commission. The empty chair draped in a cloak, suggestive of a throne covered with a king’s robe, symbolizes Washington’s act of retiring from his position of power. General George Washington Resigning His Commission, painted between 1822 and 1824, was the last of the four paintings that John Trumbull created under his 1817 commission from the U.S. Congress. To depict accurately the figures in the painting, Trumbull copied miniatures he had painted previously, studied portraits by fellow artists, and contacted members of Congress for portraits of the delegates. He based the representation of George Washington on one of his own earlier portraits. Some figures not present at the actual event are shown, including James Madison and Martha Washington and her grandchildren, who appear in the gallery. Trumbull visited and sketched the room, the Senate Chamber of the State House, in 1822, but in creating the painting he altered some elements. The Chamber no longer contained the furnishings used at the time of Washington’s resignation. Rather than depict the newer furniture created for the room in 1796, Trumbull copied the chairs he had painted in Declaration of Independence; Washington’s larger chair differs from those in which the delegates are seated, which contributes to the suggestion of a throne. The painting was completed in April 1824, and Trumbull took it on tour during the rest of the year in Boston, Providence, Hartford, Albany, Philadelphia, and New York City. General George Washington Resigning His Commission balances the first of Trumbull’s Rotunda paintings, Declaration of Independence. The two paintings are similar in composition, with figures seated and standing in the background. The central action in each is the presentation of papers: here, by Washington; in Declaration, by Thomas Jefferson. Both scenes take place in the chambers of a civilian legislature, and Trumbull’s use of similar chairs subtly reinforces the relationship between the two paintings. A smaller version of Washington Resigning that Trumbull completed in 1828 is part of the collection of Yale University Art Gallery.